I’m sure all of you have attended many meetings during your lifetime. Have you ever sat in a meeting that was so bad you wondered what you were doing there? I think everyone has been in that situation at least once. It’s frustrating and a waste of time! That is why we need to learn how to have effective meetings. 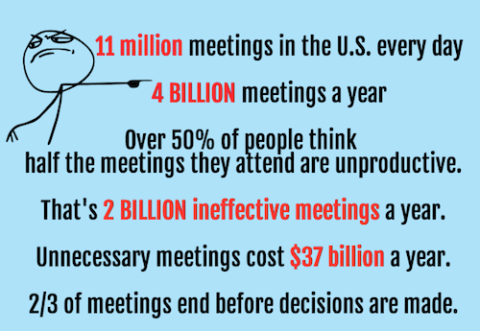 Here are some surprising statistics about meetings in the United States which prove we could all benefit from more productive meetings. There are several things you can do to make your meetings more effective. Have a clear purpose for meeting. If you don’t have a clear purpose, do not meet. Once you establish your meeting’s purpose, develop an agenda with times against each agenda topic. Ensure you’ve allocated enough time for the meeting in order to complete the tasks you’ve outlined in the agenda. Invite only the relevant and interested people to the meeting. Send out the agenda ahead of time so that the participants have the right information with them and they are prepared for the topics that will be discussed. Set up the meeting in a room that is large enough for the number of participants. Make sure that the necessary equipment is available in the room in order to conduct the meeting. For example, if anyone needs to show things to the other participants, ensure that there is a laptop, projector, and screen in the room. If you are the Meeting Leader, determine a Minutes Taker and a Time Keeper ahead of the meeting and ensure those individuals agree to their roles. Ensure the participants know who the Minutes Taker and Timekeeper are at the start of the meeting so that those people can do their jobs effectively. Give everyone a chance to contribute in the meeting, but encourage participants to pay attention and have only one meeting at a time. This is not the place for people talking over other people or having side meetings. Ensure everyone knows their Action Items before the meeting ends. If you get through your agenda before the meeting time is up, let participants leave early. Everyone likes to get some extra time back in their day! Have the Minutes Taker send out the Minutes as soon as possible after the meeting ends. This will enable the participants to complete their Action Items, particularly if there is another meeting scheduled soon. Follow up with the participants and ensure the Action Items are completed so that other meetings don’t need to be held if all is resolved. If another meeting is being held, and you cannot attend, ensure that the Meeting Leader knows that you cannot attend and has the status from your completed Action Items. Keep these 16 things in mind as you go about your business this week. It will help you and your colleagues be more productive. Sandra Glanton is the owner and managing consultant of Projects Accomplished! She spent two decades managing projects and facilitating meetings at a local multinational corporation. She still manages projects and helps her clients conduct effective meetings. She can be reached at sg@projectsaccomplished.biz or (585) 230-0649.